U.S. Security Associates (USA) is pleased to announce the appointment of Brian Gimlett as President of their Andrews International Consulting, Investigations and International (CI&I) Division for the United States. The appointment of Brian further solidifies USA’s position as the market leader in providing the most complete range of safety and security solutions. August 10, 2017- U.S. Security Associates (USA) is pleased to announce the appointment of Brian Gimlett as President of their Andrews International Consulting, Investigations and International (CI&I) Division for the United States. The appointment of Brian strengthens the security company’s renown expertise in consulting and investigative security solutions that identify risks and mitigate today’s most pressing threats. Brian brings more than 35 years of specialized security experience having served roles in both the government and private sectors in leadership and protective capacities. Of note, Brian spent 22 years with the U.S. Secret Service. In his final assignment with the elite protective agency, he served as Special Agent in Charge of the New York Field Office where he was responsible for criminal investigations and directed security arrangements for numerous high profile events and individuals, including the President of the United States, numerous Heads of State and Pope John Paul II. Prior to joining USA, Brian worked in a number of private sector industries in various capacities. 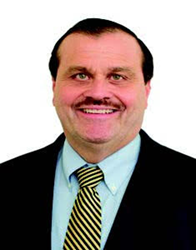 He served for eight years as Senior Vice President for Security, Aviation, and Fleet Departments at MBNA America Bank. Following that role, he worked as Chief Security Officer responsible for security for New York Stock Exchange Euronext and as Executive Director of Global Security for Wyeth Pharmaceuticals. U.S. Security Associates (USA) is the market-leading, wholly-owned, American, full-service safety and security solutions provider. With over 160 locally-responsive offices, international locations and over 50,000 dedicated professionals, they offer the most complete array of physical security, remote surveillance, and global consulting and investigations to ensure better outcomes for thousands of clients and a range of industries. Innovative applications of leading-edge, proprietary technology enable USA to rank annually among the world’s best training companies, sustain the highest standards of quality, and underscore world-class customer service with unparalleled accountability. USA’s rise as one of the largest innovative security solutions leaders is a natural byproduct of these differentiators and enables the company to provide the most Safe. Secure. Friendly.® environments for people, assets, and brands. For more information, visit http://www.ussecurityassociates.com.